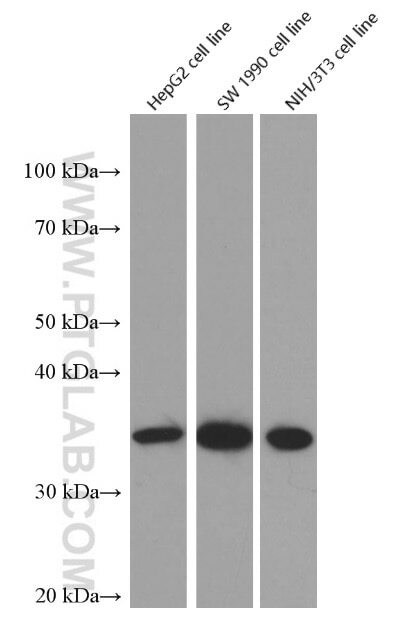 WB result of Cyclin D1 antibody (60186-1-Ig, 1:12,000) with si-Control and si-Cyclin D1 transfected HeLa cells. CCND1 (cyclin D1), also known as PRAD1 or BCL1, belongs to the highly conserved cyclin family, whose members are characterized by a dramatic periodicity in protein abundance throughout the cell cycle. CCND1 forms a complex with and functions as a regulatory subunit of CDK4 or CDK6, whose activity is required for cell cycle G1/S transition. The CCND1 gene, located on 11q13 has been reported to be overexpressed in mantle cell lymphoma (MCL) due to the chromosomal translocation. CCND1 has been shown to interact with tumor suppressor protein Rb and the expression of this gene is regulated positively by Rb. Over-expression of CCND1 is known to correlate with the early onset of cancer and risk of tumor progression and metastasis. MiR-16-5p mediates a positive feedback loop in EV71-induced apoptosis and suppresses virus replication. Therapy Effects of Wogonin on Ovarian Cancer Cells. Shrimp miR-34 from Shrimp Stress Response to Virus Infection Suppresses Tumorigenesis of Breast Cancer. High expression of TMEM40 is associated with the malignant behavior and tumorigenesis in bladder cancer. 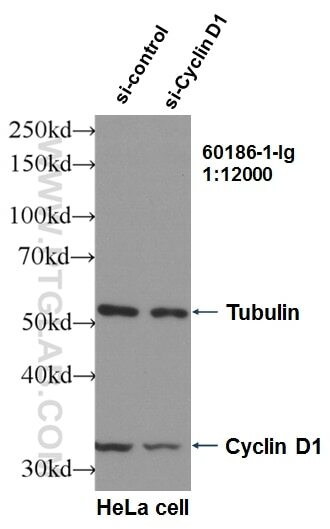 NF-κB and JNK mediated apoptosis and G0/G1 arrest of HeLa cells induced by rubiarbonol G, an arborinane-type triterpenoid from Rubia yunnanensis. YAP triggers the Wnt/β-catenin signalling pathway and promotes enterocyte self-renewal, regeneration and tumorigenesis after DSS-induced injury.